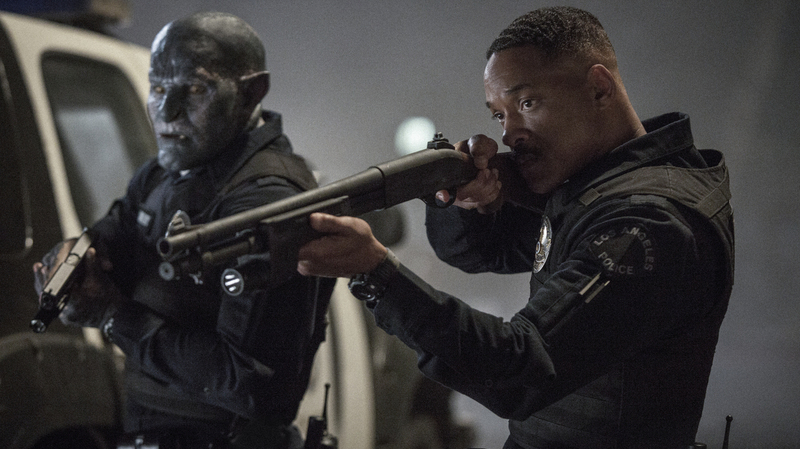 Will Smith Plays Cops-And-Monsters In Unremarkable 'Bright' Smith is a police officer paired with an orc (Joel Edgerton) in this fantasy-inflected buddy-cop movie that's "lazy but not boring" and "perfectly, stubbornly mediocre." Mediocre Meaty Ogre: Joel Edgerton is an orc named Nick, Will Smith is a human named Daryl in Netflix's Bright. Joel Edgerton's performance as Stanley Kowalski opposite Cate Blanchett's Blanche DuBois in the Sydney Theatre Company's 2009 A Streetcar Named Desire was one of the most unforgettable things I've ever witnessed on a stage. It would mark the pinnacle of a lesser artist's career, and an impressive career it would be. But for Edgerton, one of the many burly Aussies who has found steady employment playing American tough guys, mastery of Elia Kazan's vaunted Method was but preamble to strapping on a gun, pinning on a badge, and pulling on a lightly distressed Shrek mask in Bright — Netflix's feature-budgeted monster-cop thriller. Monster Cop sounds like a well-established genre, doesn't it? Before Bright's hip-hop title sequence has even finished showing us, via graffiti, the social order of this movie-verse — elves are the slender and bejeweled one-percenters, orcs the rotund and systematically oppressed underclass, with humans in between — you'll likely feel you've tuned into the 11th episode of its second season instead of something ostensibly new. That's because the buddy-cop template is so indelibly etched in adamantium that even putting the shaky rookie in monster makeup and making the MacGuffin a magic wand (that's really what Max Landis' script calls it) instead of a briefcase full of heroin of whatever barely affects the result. Critics have already lined up to pillory Bright as among the year's worst releases. Don't believe the clickbait. Lazy but not boring, this Net-flick is perfectly, stubbornly mediocre, and less a chore to sit through than either of 2017's Vin Diesel vehicles. Anyway, I'm burying the lede here. A big chunk of this living room-sized dirty-cop thriller's $90 million budget must've gone to secure the services of Will Smith as the human — the part he was born to play, baby! (Suicide Squad, his prior collaboration with Bright director David Ayer, was a worldwide hit despite its abundant awfulness, so maybe he's still got some juice.) If nothing else, Bright reminds you how much fun Smith is to watch even when he's coasting: He's likeable and convincing as a rank-and-file uniformed flatfoot, drowning in debt and still five long years away from his pension. Smith can land a quip better than just about anyone in the game, but he dials down the cockiness of his heyday, mostly. "Fairy lives don't matter," he tells his day-drinking neighbors in an early scene, before swatting the fairy that's been eating out of his birdfeeder with a broom. The joke is in such abysmally poor taste that it primes us to expect a more scabrous and lively sci-fi parable—something in the vein of the original RoboCop or They Live or District 9 — than the familiar survive-the-night scenario Landis, seemingly writing on a dare, coughs up. Ayer purportedly reworked the screenplay to his liking, and certainly Bright feels like one of Ayer's downbeat law enforcement morality tales — he wrote Training Day and wrote and directed End of Watch and Sabotage. This time around, the chance to procure that magical wand —"like a nuclear weapon that grants wishes!" someone explains —is temptation enough turn many of Smith's brothers in blue (including, in the movie's most welcome casting coup, Margaret Cho as a pitiless sergeant) against him. They already hate him for refusing to help them railroad his orc partner anyway. The wand is the stolen property of Dragon Tattoo Girl-turned-Elf Queen Noomi Rapace, who wants to use it to bring about the return of the Dark Lord and the subjugation of all human and orc life, which is explicitly forbidden by the California Penal Code. The term "Bright," by the way, refers to those uncommon specimens who were born with the je ne sans quoi it takes to wield a wand. Brights are rare among elves and all but unheard of among humans. The dirty job of explaining all this falls to the movie's other marquee player, Edgar Ramirez, who plays the nattily-dressed Special Agent in charge of the FBI's Magic Task Force, which is devoted to fighting cyber crime. I'm kidding. Whereas Rapace seems to be having a blast in her creature makeup and prosthetic fangs and contact lenses, Ramirez's embarrassment is palpable through his elfin makeover. Maybe that's because he and his G-man partner, Mindhunter's Happy Anderson, are cursed to appear only in Bright's silliest scenes. The CGI armageddeon stuff is just as visually indistinct as it was in Justice League, but the scenes of Smith and Edgerton driving around on patrol, bickering like all the Murtaughs and Riggses and Crocketts and Tubbses and Cagneys and Laceys who've sat in cars together on stakeout since the First Age of Middle-Earth — lo, they cast a mighty spell of pure adequacy. You are, in likelihood, too old for this s--t. But I, apparently, am not.